So we made it to Michigan. I could go through a laundry list of the last week of our life and the things that have gone oh so beautifully right and the things that oh so crazily wrong. Since it is Friday and we are all about gratitude I have to say there is so much to be thankful for. I know moving is hard…my gosh I know it is hard…but having a baby along for the ride and said baby get sick may be the icing on top of a real way to go out. Who knew that there is a small virus that is completely harmless that most babies get between 6 months and two years called Roseola that spikes a high fever for two days with no other symptoms and it breaks and they get a nasty rash that doesn’t itch and then they are through it? I didn’t but it took two doctors to figure it out, but now I know. All that to say, I am planning a whole post about how to move with a baby, because there are so many things I have learned in the last few weeks and things I think worked great and things that really didn’t. I also know we aren’t the only people insane enough to think we could do this, so I figure a post might be helpful to any of you thinking of attempting this or being forced into because of life changes. The good news is that it is possible and if we survived it, you can too! Now, that we are in Michigan, we will be spending the weekend resetting and relaxing and moving up to our new rental that we will live in till our house is completed hopefully around this time next year, which is about to be a huge part of our story. I also have been working on a post about what we are planning with this transition to Michigan and how life here is about to take a dramatic shift in a direction we hope you guys will be as excited about as we will be. So, I am off to relax to the next level and get some much-needed R&R after the week that felt like a month and to get settled into this next chapter. Here are a few links for your weekend that we thought you might also enjoy. This is a new podcast we are completely obsessed with. We aren’t people who enjoy science much but them testing some big polarizing ideas is really cool to listen to. I particularly loved this one on Attachment Parenting as a new parent. This little story from a children’s book is such a necessary reminder about life. Pinterest Predicted the top home trends. Which do you love? This. Just this. Cause it made me laugh. Mike and I have serious big laughs whenever we watch Casey Neistat unpack anything on his Youtube channel. This one at 5 min in is our favorite. PS. he is our favorite follow on Youtube. Speaking of Youtube, if you are an influencer/blogger/etc we HIGHLY suggest you watch Fohr Card’s A Drink With James series. Great tips and thoughts on the ever-changing landscape of influencer marketing. Loving this sweater so much for fall and winter. So in love with this kitchen at this cabin! Another couple’s take on Working Together in prep for next Monday’s Working Together (October 3rd). Love that JCrew used real life people for their Fashion Week show. Plus these outfits are spot on! In other fashion news about real people, love this update to Elizabeth Suzann! As we are beginning to plan our future garden and farm in Leelanau, I have been researching in my spare time everything about gardening on small-scale. This restaurant in Prospect Heights in Brooklyn has some amazing ideas and features. Have any of you been? Would you guys try this recipe for Zucchini Pizza Crust? I have bene gluten-free with Hayes the last couple months because of some irritations he was having from my milk we thought might be tied to wheat so I am hunting all sorts of alternatives to my favorite guilty pleasures. Have a wonderful weekend! What is something that caught your eye this week? 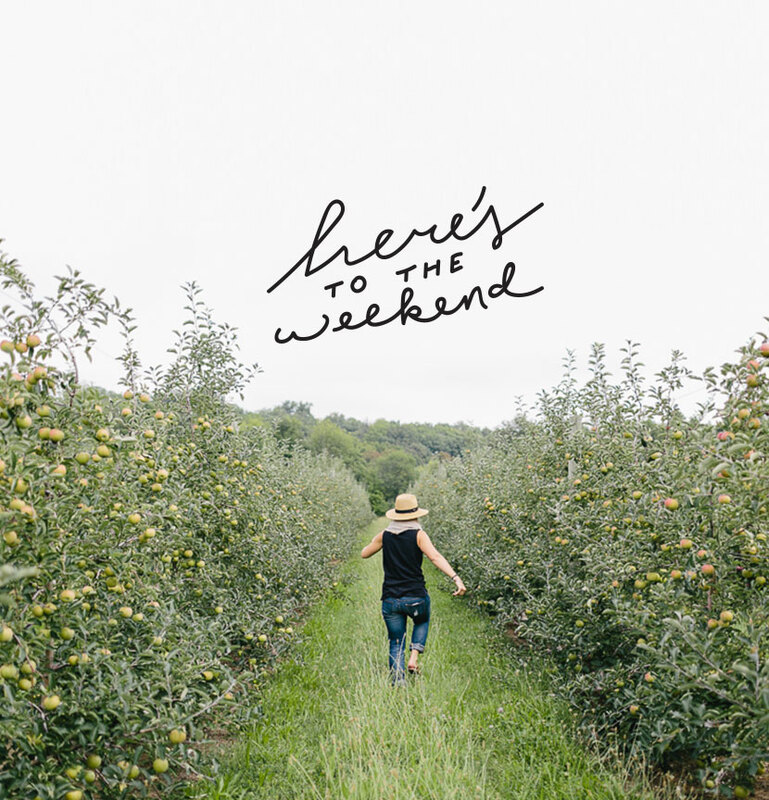 You’ve definitely earned your R&R this weekend! Looking forward to seeing what’s ahead for you guys. Happy Friday! Congrats on completing the move! Hope you guys are able to really relax and enjoy some down time. Looking forward to the post on moving with a baby – i may be in that situation in a few short months! Thanks so much!!! I am so glad you are loving the Working Together series.